Are there any good, recommended videos on using a logic probe? I know there are some good write ups, but I am better with visual learning tools. Maybe a video of someone using a probe on a dead Bally 35 series or a Williams System 3 - 11 board ? I think this is what I used. A video isn't really needed. red lead to 5V that's powering your circuit. If the voltage at that pin is 5V (or near) the probe will beep a high tone, light an up arrow, or both. If the voltage at that pin is 0V (or near) the probe will beep a low tone, light an down arrow, or both. If the voltage is fluctuating between 5V and 0V, the probe will beep high low, and both arrows will light. DO NOT use your probe to test for voltages higher than 5V unless you want a meltdown in your hand. I'd still watch Adam's videos, especially the one where he's discussing logic diagrams. In fact, his viewer mail #2, he mentions my name for one of the mail items. I don't even own a logic probe...either at home or at work. I troubleshoot logic with a DMM, and very occasionally an oscilloscope for analog audio troubleshooting or taking a frequency measurement. Don't over complicate it. All you're doing is comparing one point in the circuit to a known reference point at another point in the circuit. You are, the vast majority of time, expecting a pulse...the literal heartbeat of the electronics. Take for instance the 6821 PIA used on Bally games for a number of years. 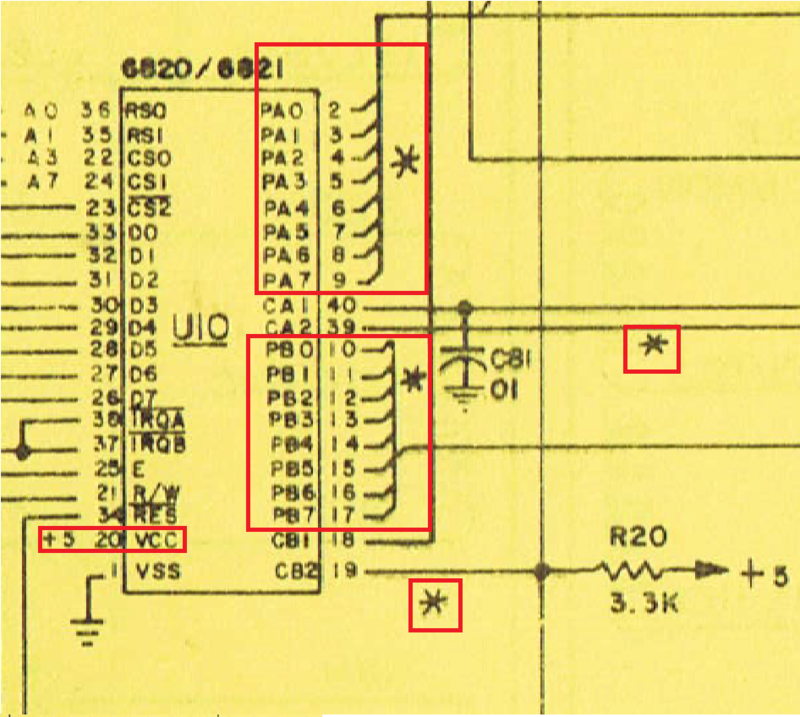 Note in the schematic drawing some of the lines are marked with "*" indicating a "test point". Those points are supposed to be tested by the AID device, but as it so happens all those lines associated with * should be pulsing (when compared to +5 VDC as shown by pin 20). So with your logic probe clip leads black on TP4 (ground) and red on TP5 (+5VDC), all of those * should be pulsing. Some pulse with either or both the HI and LO lites as well as the PULSE lite, but as long as it's pulsing it's probably OK. When a pulsing line shows up stuck HI or LO or NO LITE (no signal detected at all), that's your sign to find out if that line really should be pulsing and follow it back to where it begins. Interesting. I was going to get one. I suppose if you're getting 5v, the signal's high, 0v low? Are you able to tell if it's pulsing? I'm thinking that that would depend on how good the DMM is. That's the idea, except the voltages to determine a high or low is a range. So 0.5 V DC is a logic low, it doesn't have to be exactly 0, or 3.5 V DC is a logic high. A chart below for TTL is an example. For pulsing, my Fluke 79III has frequency measurement capability. If there is no pulsing, I'll get 0HZ, if there is, I'll get some frequency measurement. If I need details such as timing, or audio waveforms, I bring out the oscilloscope.